admin 4 years, 10 months ago. This week, we received this article in our mailbox. It is from Andrei, an Electronics Engineer who used to read our newsletters where we always remind you that you can send us your own articles. What do you think of his 1st attempt? Multiway switching can be found in almost any electrical system blueprint today. The amount of comfort it provides defeats the small increase in price by offering the user to turn on and off any electrical equipment from more than one location. The most common application of multiway switching is for lighting systems and it is usually put into practice in common areas of a building. Switching the lights in hallways, reception areas, kitchens, living room areas from many points in the building is a nice feature. 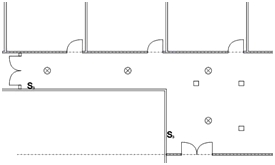 In the image to the left we can identify a hallway that goes into a larger common area and two double door exits. What multiway switching does, is to allow us to control the 4 lights in this area from either one of these exits by connecting a 3 way switch near the doors. The 3 way switch is basically a SPDT switch (Single Pole Double Throw) although in practice you can have a Double Pole Double Throw switch to control two independent lights or groups of lights. Figure 1 shows the basic connection diagram of such system that allows control from two locations. As you can see the 3 way switches sw1 and sw2 do not have an on or off position. 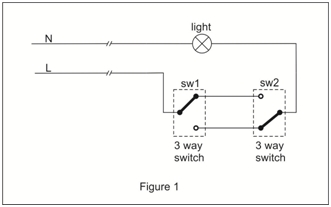 As depicted in figure 1 the light is off and in figure 2 we turn on the light with sw1 in 2.a and with sw2 in 2.b. Depending on your switch brand and type you will have to identify the connections. If it is not marked you can use a multimeter set on wire continuity test to indentify it. To control lights from more than 2 locations we need another type of switch called a 4 way switch, a crossover switch or simply a cross switch. It will always be installed between the two 3 way switches. 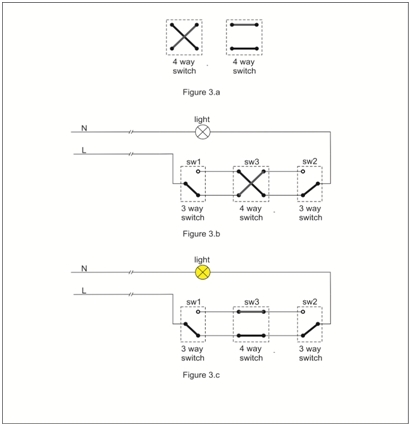 The connections done with a 4 way switch are depicted in figure 3.a below. Just like in previous case this switch does not have an on or off position. 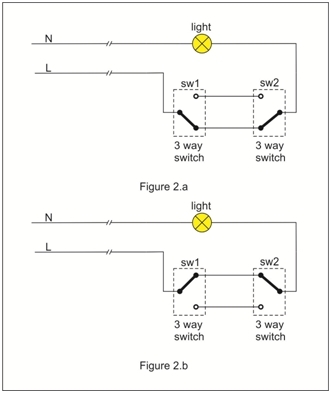 In figure 3.b the light is off and in figure 3.c the light is turned on from the 4 way switch. You can add as many 4 way switches in between sw1 and sw2 as you need to control lights from many locations. On the market you will also find double 3 way and 4 way switching to independently control 2 groups of lights. There is a certain increase in cost and complexity of the circuit that is why it is imperative to use junction boxes for any of the switches. With double 4 way switches you will have up to 9 wires that will go down from the junction box so it can give a lot of headache on maintenance jobs. I heen in the electrical trade for 50+ years and in your article Multi-way Switching ,the terminology for the switches is incorrect . You refer to a switch as 3 way ,in all manufacturers literature it is defined as 2 way or a single pole change over and the switch classed as 4 Way is in fact called an intermediate switch ,unless you have catalogues that indicate otherwise. You must be aware of the fact that there are billions people living without electricity out of USA in this 21st century. For Example: In Afghanistan, only 6% people have access to home electrical power though, we have the potential to generate 23,000 MGW Hydropower in Afghanistan from the rivers we have. We engineers all around the world are not serving the real needy human. We, engineers are confined under wrong- doing Politicians and cannot share our knowledge/experiences among engineers all over the countries in the world. It is recommended to organize Engineers Communities to be able to communicate views among all engineers of all countries specifically, in Afghanistan. We Yanks call them “3-way” and “4-way” switches. “2-way” and “intermediate” are the corresponding British terms. It’s the easy and practical way. Be continuing for the timing.